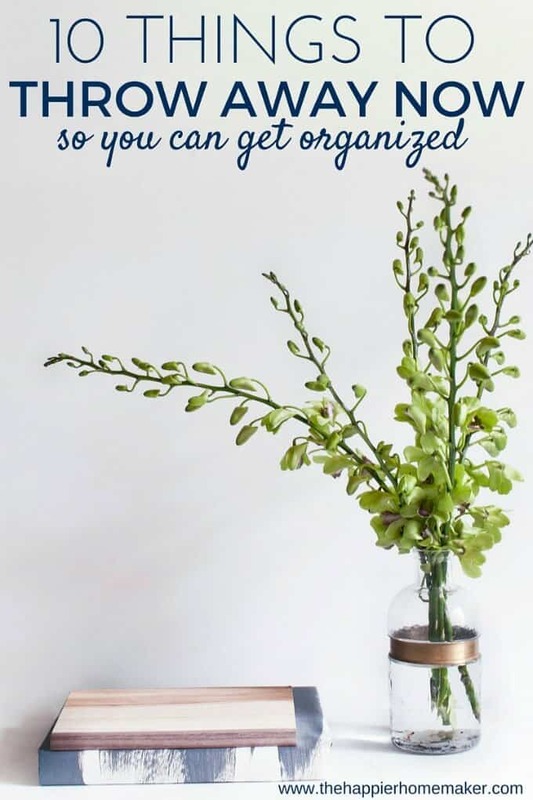 It’s the almost the new year and I’m willing to bet that quite a few of you have turned your thoughts to getting organized. For me personally, organization doesn’t come naturally-I’m a bit scatterbrained (I like to think of it as talented at multi-tasking!) My husband on the other hand is the stereotypical military guy-a place for everything and everything in it’s place! Through our marriage he has helped me immensely at getting and keeping organized as well as resisting that ever present urge to keep things “just in case!” If you’re like me and like to hold on to stuff just because you need today’s list of 10 Things to Throw Away TODAY to help you get organized-you’ll feel instantly more orderly and be impressed with the reduced clutter in your home-I promise! I recommend going through this list one item at a time and finishing one step before moving on to the next. Each of us will have our own area that is harder to purge than others-for me it’s old clothes-I have a hard time getting rid of things if they still fit even if deep down I KNOW I’ll never wear them! I’ve tried to list start with a few easier ones before I get to the more sentimental categories! Like many people I have a tendency to keep old magazine issues-who knows when I’ll want to look through them for inspiration? The good news is that we now have a magical thing called Pinterest that fills the same need-there’s never a lack of inspiring photos to look through there! Do yourself (and the environment) a favor and recycle the stacks of magazines laying around the house! Being a military family we move about every two years so that gives me an excuse to clear the pantry and cabinets at least that often. For those that aren’t so transient it’s helpful to clear out the pantry at least once or twice a year…I like to try to plan “eat the pantry” meal plans a few times a year where I pull out those cans and boxes from the depths of my shelves and plan meals around those so my food doesn’t get wasted. Always make sure your pantry items are not expired and rotate your cans and other shelf items so older items are used first. While some receipts and bills are necessary to keep record of, others aren’t needed long term. If you’re already using an item and it’s past the return timeline, toss the receipt. For other papers you need to keep and have record of try an document scanner or a document scanning app to save it digitally and clear your clutter! You’ve done awesome with the first few items on the list I’m sure but now it’s time to get brutal with your closet. For many women especially I think this is a hard one. Be honest with yourself as you go through your clothing-if you haven’t worn it in the last year it’s time to say goodbye. If it’s a seasonal item (think ski pants) that you’ll need in the future, box it up in storage until you plan that vacation. Same goes for clothing that doesn’t fit-donate it or sell it online to make a few extra bucks. My mother always told me to turn all my hangars around at the beginning of the year and as I wear an item turn it the proper way-anything left hanging backwards at the end of the year can be tossed without regret! This is one area that my normally super-organized husband starts to get a teensy bit hoardish-old electronics! I’ve discovered his secret stashes of old iPods, digital cameras, etc. At one point we had three TVs in a storage area sitting unused. In this day and age of constant technological upgrades many times we have old electronics that still work so it’s easy to excuse keeping them even when you know you won’t be using them. Ask yourself if you’re really going to go back to using that old gadget and if you can’t imagine backtracking your technology-toss it. Better yet, donate it to an organization where it can help someone who might not be able to afford that technology otherwise. *Again, electronics are another item that shouldn’t be thrown away in the regular trash-check with your community’s laws on how to properly dispose of electronics that can’t be donated! This one is painful for me, especially when it came to my first son-I was so excited when he started drawing and writing his name in preschool I saved EVERYTHING. By time my youngest hit preschool age I was buried in crayon drawings and realized I needed a better system! I take the memory box system-each kid has a box and I save only their very best work. I also cull the papers and pictures occasionally to make sure that I’m not over-saving. While I love looking back at their past drawings I know that I don’t NEED twenty dinosaur drawings from June of 2009 crowding my closets-one will do! This one is a hard one so I’m going to make the last two categories easier on you! I have a huge jewelry box and wear the same five pieces over and over. A while back I finally went through it all and got rid of the obviously cheap or overly trendy costume pieces I had from high school and college as well as anything that was broken and not repairable. When I was finished I found that it was much easier to find jewelry to wear when I didn’t have so many choices and had pared my collection down to the pieces I really loved. Did you catch those mascara and liquid eyeliner recommendations? When it comes to your eyes do NOT mess around, eye infections are no fun! I like to take a sharpie (I keep it in my makeup organizer) and write the “toss date” on my makeup when I very first bring it home-that way I can know when it’s time to replace it without any guesswork. Are there any of these categories that you have a hard time throwing away? Let me know if you make it through the entire list and how it makes you feel-I for one feel a HUGE improvement in my home’s looks and those feelings of clutter every time I take the time to go through the checklist! « 100+ Healthy Recipes to Start the New Year Right! previous post: 100+ Healthy Recipes to Start the New Year Right! Great post Melissa! I’m guilty of many of these clutter areas. Your tip on rotating the hangers in your closet; this was an eye opener for me a year or so ago when I did it. I didn’t realize how much I WASN’T wearing. I’ll be implementing the kids drawing clean up ? and makeup this year, Eek! Thanks again! Thanks Mistie! I need to tackle my kid’s clothes this week-I have been keeping mine under control but with three boys and all the hand me downs between them their closet is a mess! Great tips Melissa! Thanks for sharing. I will never get rid of my clothes or jewelry. I love having lots of jewelry choices. With clothes, my weight changes so much, I can’t afford to replace them that often. I lost a lots of weight and ended up selling most of my clothes at a consignment store or giving them away. then a few years ago the weight started coming back. I have had to replace all of the clothes again. So, now I keep everything just in case. I like your idea of labeling bags or bins. I just put it all together. The makeup is so hard to get rid of! I am going to use your cheat date sheet, but still looks fresh!! Have one place to display their work for a short time (I have empty frames hanging where I display a work of art until the next one comes along to replace it. Then photograph your child with the artwork, print & put it into a photo album. It’s so nice to chronicle what the child looked like about the time they made it. Then we either toss the work or find someone to donate it to. We were fortunate enough to have elderly neighbors who loved the little visits that came along with the artwork. = Happiness all the way around! Great idea Catherine, I love it!